Do you have allergies, mold problems in your house or odor problems? This is the Ultimate Central Air Purifier, it sterilizes the air for the whole house 24 hours a day – and it doesn’t and it is just a tiny investment in the air quality of your house! Are you sensitive to odors? It’s made to help eliminate odors too! The Purification System is installed in your central heating & cooling system where all of the air in the house has to circulate through it. 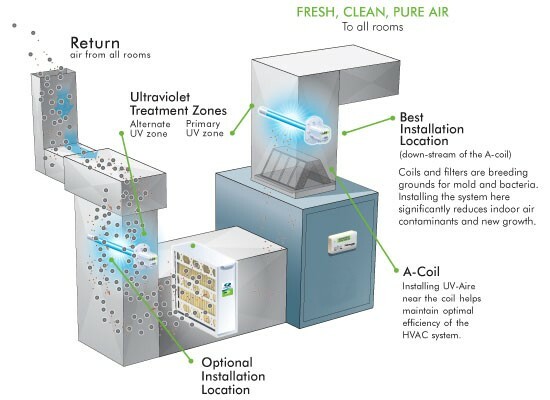 Once air passes through and gets cleaned and sterilized by the UV rays in the Air Purification System then the air throughout the entire house is sterilized. You will breathe clean air in any part of your house. 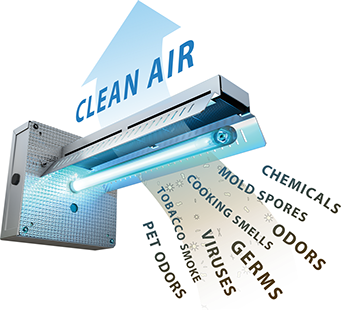 Airwiz can install a purification system that will make the air in your whole house free of odors, mold and allergens!